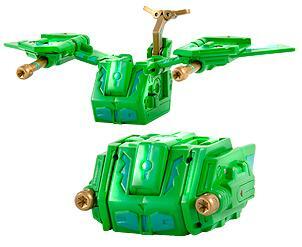 Swayther is a Bakugan Battle Gear. When engaged it spreads out its wings and attacks with its two blaster barrels. One barrel shoots fire, while the other a freezing chemical. It drops colossal bombs that release a thermal wave incinerating anything, or anyone in its path. It is Hawktor's Battle Gear. Swayther finally makes its first appearance in the "Gundalian Invaders" series in episode 20, when it is first used by Shun. Purchase your Battle Gear from eBay now!